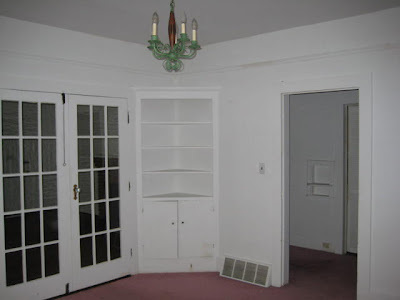 Remember this photo of the living room? 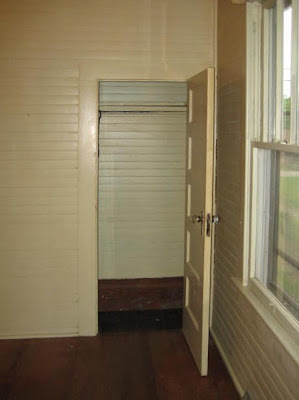 Well, that middle door leads to the hallway. It's wide for a hall, 5 feet. About midway down on the left, you can see the door which goes into the spare room. The one across it on the right goes into the dining room. And yes, the pink carpet resides here too. We were able to get a good look under it, and the floor is covered with dark gray linoleum. 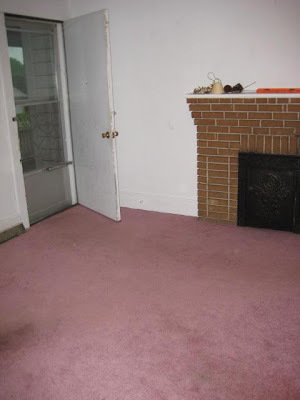 Again, not sure what to do with it, but somehow pink carpet is less offensive in the hallway than in the living or dining rooms. 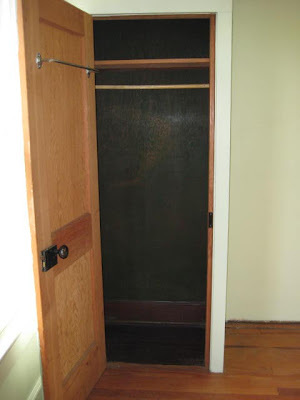 At the end of the hall is a nice deep linen closet. 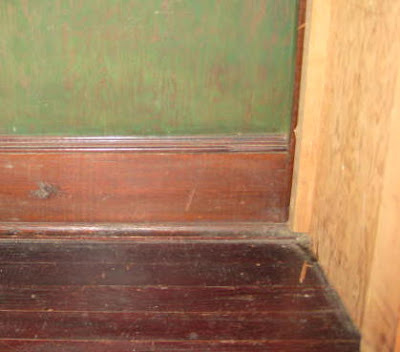 It's interior color is that same worn out green which dominated the whole house at one time. .... and this back door goes out onto the back porch. Unfortunately, we weren't given a key to it. However, this didn't deter DH, who simple lifted the door off it's hinges to remove it. 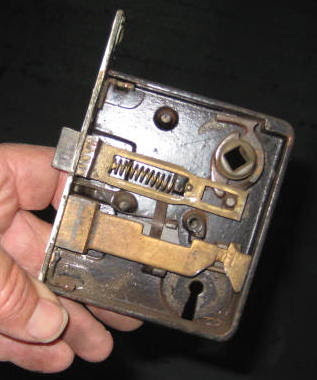 After that, he was able to open the lock mechanism to take a look. This door also has two chains on it, so until we can do something about the lock, we can still secure it. 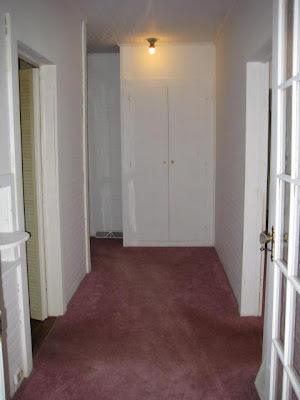 At the end of the hallway is a bathroom. I'll show you that next. 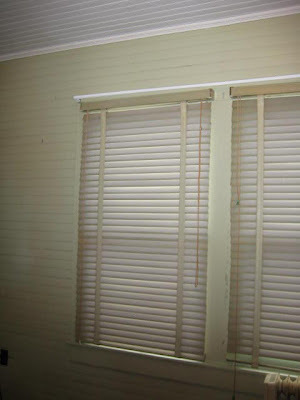 These are the old-fashioned wood slat blinds, the type used before mini-blinds came into vogue. 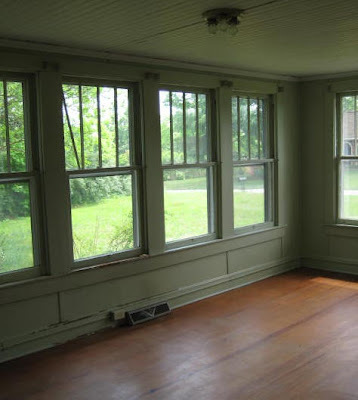 They were not only in every window in this room, but also the spare room and the sun room. 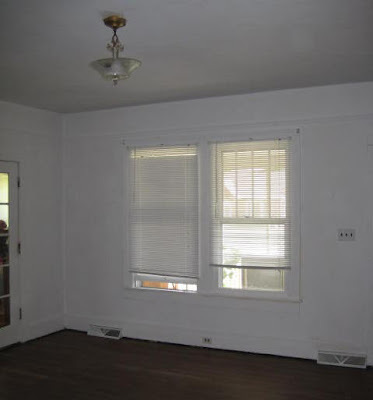 Plus we found four more in the back (which probably would have been for the living and dining rooms, which were replaced with mini-blinds) . I took them all down because they were badly in need of a good cleaning. Plus several of them are in disrepair. Once we get settled in, I'm going to clean them up and see if I can't use at least some of them. 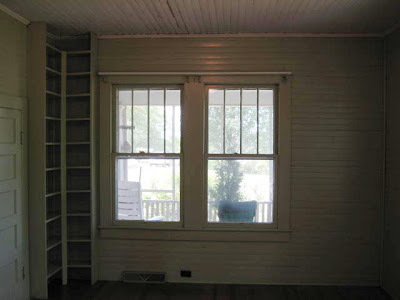 The front windows look out onto the porch. On the left is a built in book case. ... is a closet door. Like the other closets, it is shallow and long. This one is the shallowest, and at 17.5 inches, clothes hangers don't fit in it. It is also the only closet with shelves. 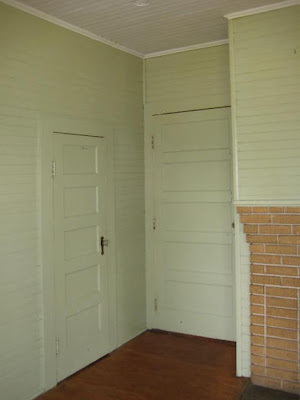 The darker green interior, is the same color that the rest of the house was at one time. 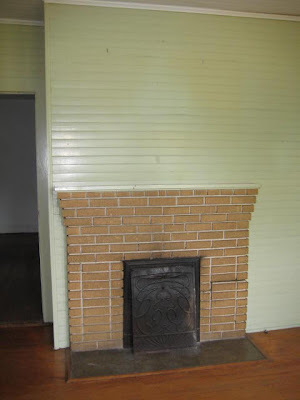 The fireplace is back to back with the fireplace in the living room and they share the same chimney. 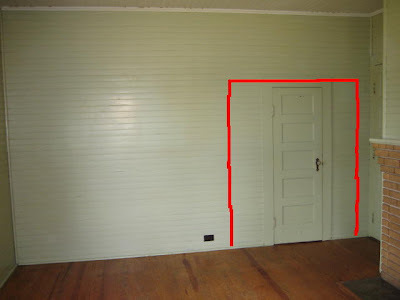 The second closet in this room is behind the bedroom door. Notice how different the doors are in size! 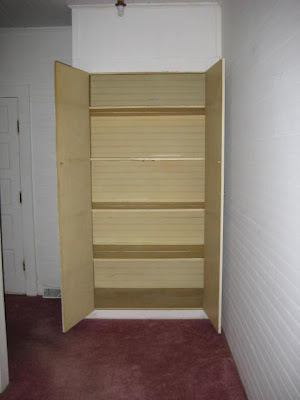 This closet had the same type of shoe rack as that in the spare room closet, but I removed it. It was painted white underneath. 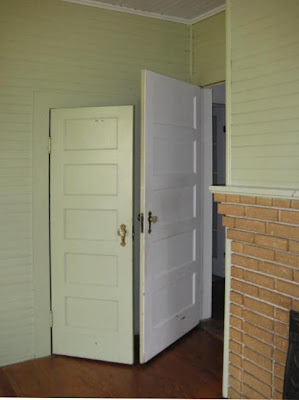 Unlike the other two closets in this house, the door is centered rather than to one side. This make the closet a little more accessible. 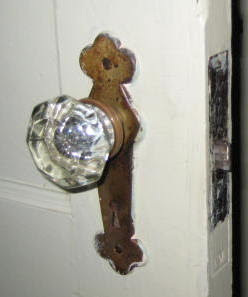 All the doors in the bedroom have glass door knobs, as do quite a few other doors in the house. I'm wondering if we couldn't cut out a larger opening and put in sliding doors instead. It might take away some of the charm, but it sure as heck would allow better use of the space! ... and this one, are original to the house. 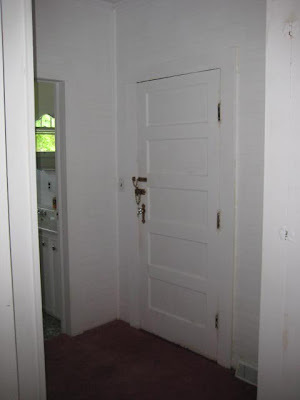 The door on the left leads into the kitchen. 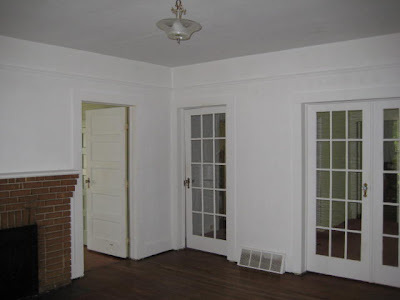 As in the living room, the walls and ceiling are plaster, painted white in recent years. And as in all the other rooms, the original wall color is green. A better look at the kitchen door. 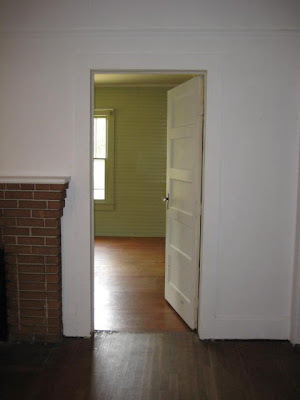 The door on the left is back where we started (leading to the hallway). 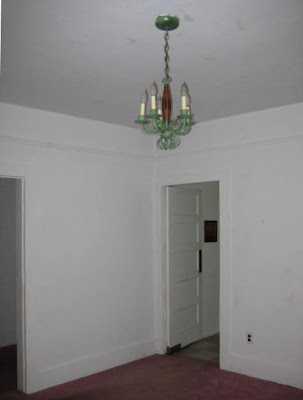 I have to comment on the light fixture. You will note that it is green. When I first saw it, I thought it was antiqued bronze. Imagine my surprise when I went to clean it and lo and behold, it was green! The big question at the moment is what to do about that pink carpet. It's pretty bad in some spots and considering how dirty the house was, I'm not real keen on keeping it. 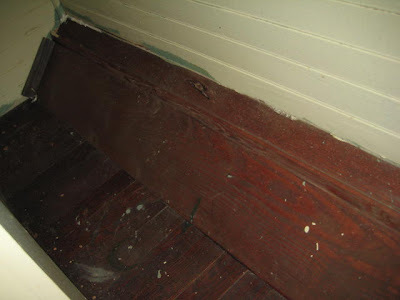 However, Dan and I took a peek underneath, but the floor doesn't appear to be hardwood. We can't get a real good look without pulling the carpet up. Now I'm wondering what kind of surprise is in store if and when we do! Not that I have anything against pink, it just isn't in my color scheme. We peeked underneath, and decided to pull it up. The hardwood floor is in pretty good shape. However, it was pretty dirty. 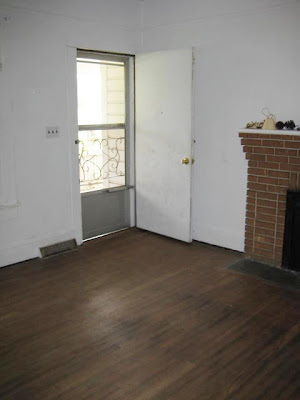 I had used Murphy's Wood Oil Soap on the wood floors in the sun room and the spare room, but this floor had some areas that looked like the dirt was ground in. 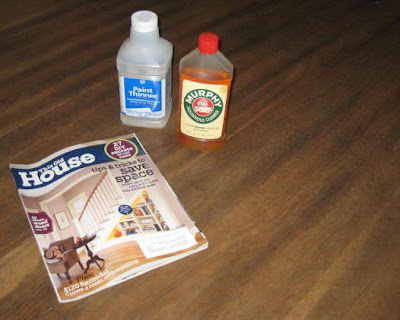 I decided to try a tip from the March 2009 issue of This Old House Magazine. I mixed the Murphy's with equal parts of paint thinner, applied it to the floor with a paint brush and wiped it off. I don't know how visible the results are, but man were my wipe-up rags every filthy! Obviously that's the front door, which leads out onto the screened in front porch. 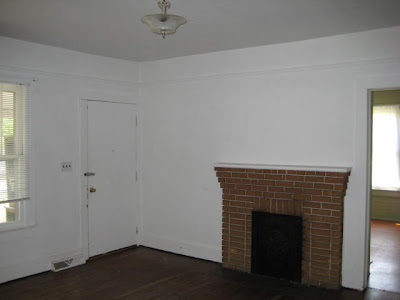 The fireplace is double sided, so that there is another hearth in the bedroom, which you can see on the extreme right. Unfortunately, these are not in working condition, as the chimney is not lined. Lining it is a possibility ... more on that at a future date. 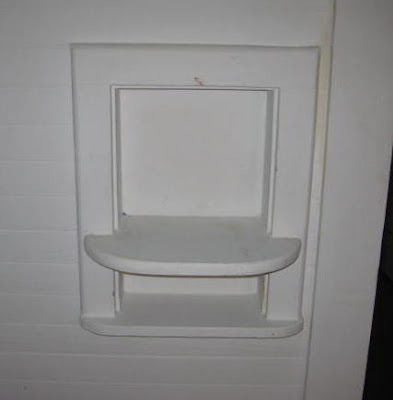 This is a step to the left of the front door. 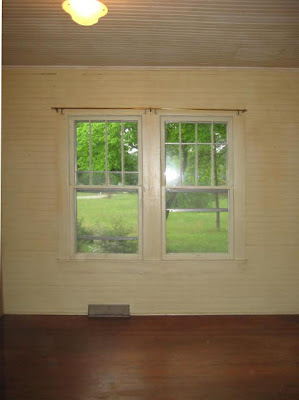 The windows look out onto the front porch. Left of these, are the doors to what will be my studio. The living room measures approximately 16 x 16 feet. The ceiling and walls are plaster, which was painted white in fairly recent years. 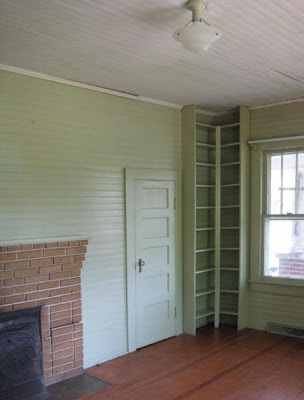 I've detected that same green (as in the spare room) underneath the white paint. 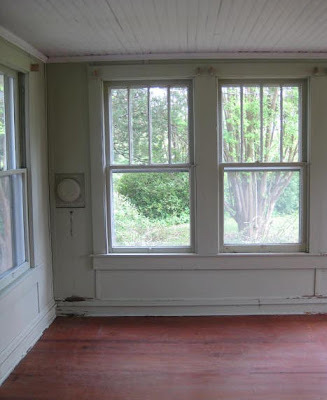 This is the former sun room, claimed for my weaving studio space. 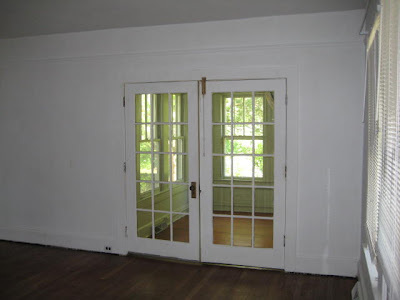 The doors on the right are to my studio, the ones on the left open up to the dining room. 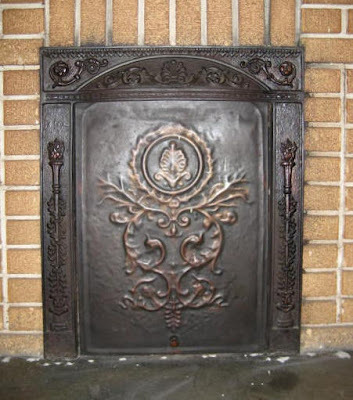 This summer fireplace cover is pretty. Unfortunately, whoever laid the carpet drove the nails right through the concrete hearth. 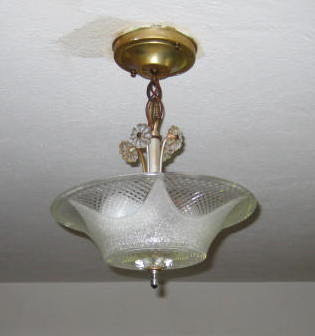 I also like the ceiling light fixture. It too was pretty grungy, but cleaned up very well. Slowly the place is cleaning up. I admit that I'm cleaning faster than I'm blogging about it :) It's fun to share this with you all however, and I appreciate all your comments! 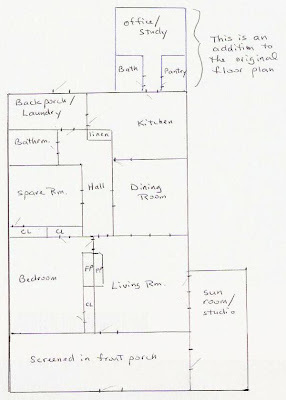 Theresa suggested that I post a floor plan, so here it is! It is very approximate, but will give you an idea of how all the rooms fit together. 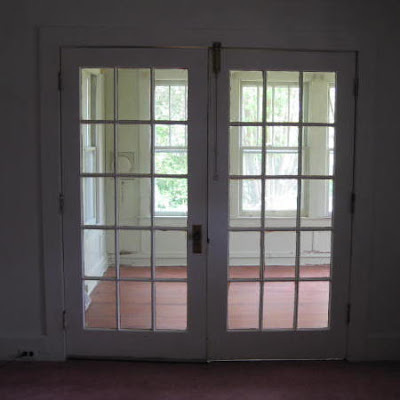 Off the hall, across from the dining room, is a bifold door. ...... into the second bedroom, which for the time being, will serve as a storage room for us. Consequently, I decided to clean this room next, so that we would have some place to start putting stuff as we brought it over. It has a nice view to the north. 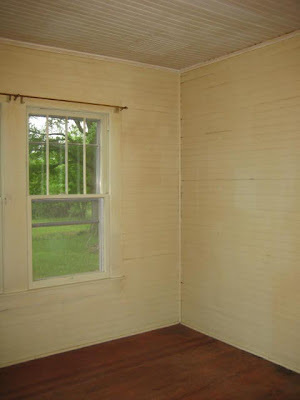 Both walls and ceiling are beadboard, and the floor is wood. 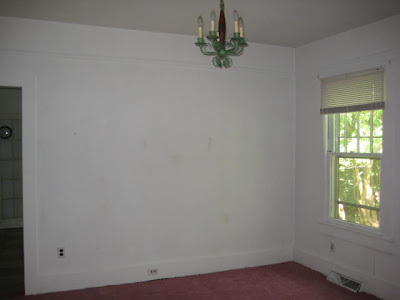 This room did not scrub up very well. 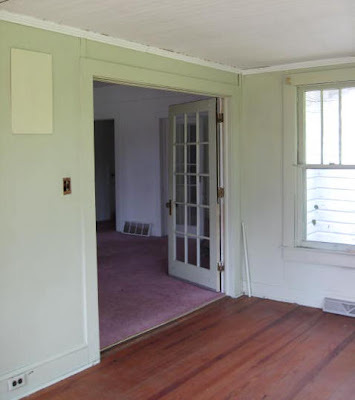 The walls and ceiling remain dingy and you can see exactly where things hung on the wall. Originally there was a regular door, but for some reason it was replaced with the bifold one which I think is rather ugly. The green on the walls is rather ugly too. I do like green, but not this particular green. No matter. Eventually we can replace the door and repaint the ceiling and walls. 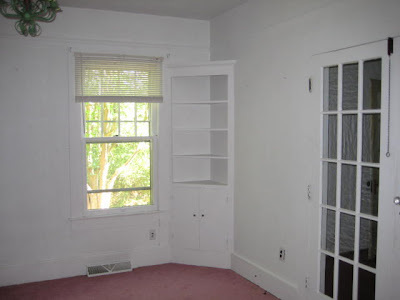 Eventually, it will become a cozy guest bedroom. I can already envision a handwoven coverlet on the guest bed. This is the closet door, and I have to say that all the closets in this house are a little odd. 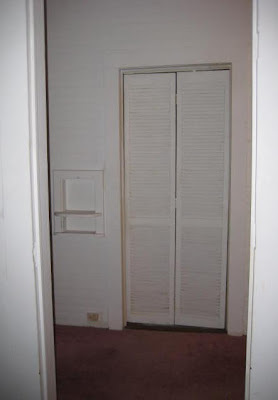 For one thing, the closet is about six feet in length running parallel to the room. It is narrow, only wide enough to accommodate clothes hangers. 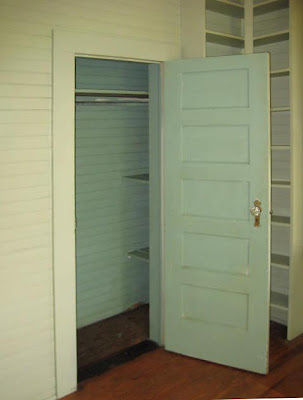 The door is offset to the side, making it difficult to get to the deep end of the closet. It is also very tall, with the same ten foot ceilings as the rest of house. This shelf is custom cut to fit into the closet space. One interesting feature are these shoe racks. They are simply an angled board at the back length of the closet with a lip added to hold shoe heels. This room will also probably hold whatever of my stash I can't find a place for in my studio. Hmm, maybe I can stack all my fleece boxes on that closet shelf, all the way up to the ceiling. All I'll need then is a good ladder to get them down again! 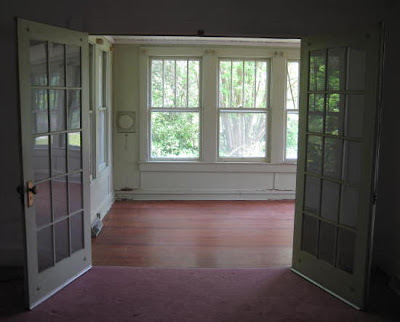 There is a set of French doors off of the living room. These lead to a sun room, which will become my studio. After thoroughly cleaning the kitchen, I decided to tackle this room next. I figured that this way, I could move a little of my stash and equipment with each trip to the house. Here is a 360 degree look at this room. 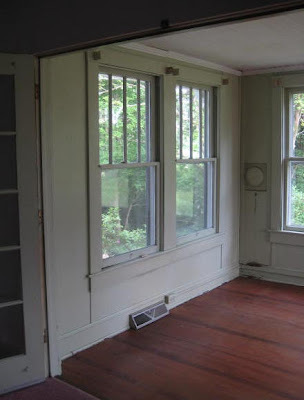 The windows on the immediate left look toward the back of the house. One thing you can see in the above photo is the beadboard ceiling. The walls however, are smooth. 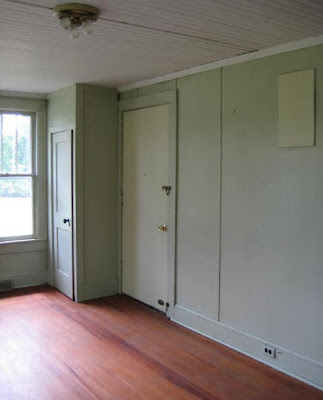 The circle on the wall in the corner is a stove pipe flue cover, leading to a chimney outside the corner of this room. 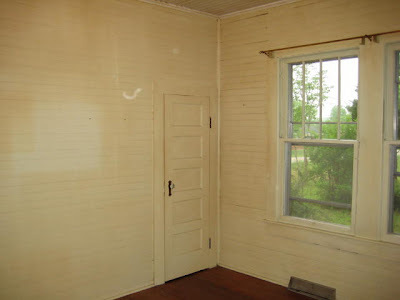 Obviously a wood or coal burning stove once stood in this corner. I say coal, because one of the outbuildings has a room with coal all over the floor. 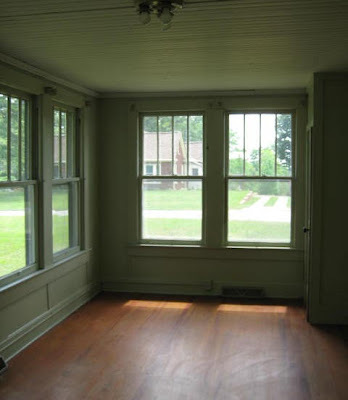 As you can see, there are lots of windows and lots of natural light, making this the perfect choice for my weaving studio! The front windows look out at the front yard and across the street. There is a closet in the corner. 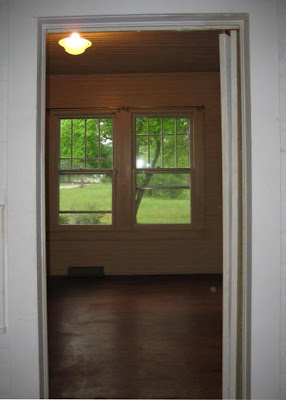 The other door leads out onto the screened in front porch. This is the only solid wall I have in this room. 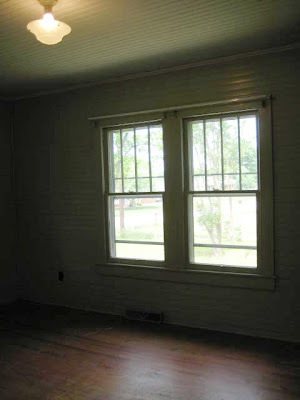 The wood floors are in fair shape, and will be much improved with sanding and refinishing. This closet was added as an afterthought to this room. Possibly to make it a third bedroom. For my purposes, I think I would prefer shelving here. 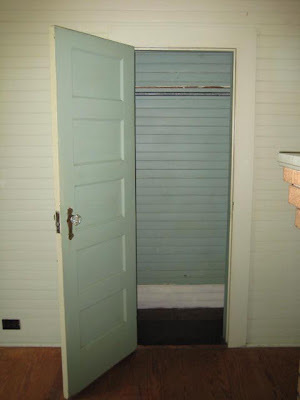 The interior of the closet offers a peek into what the room was like before it was painted. 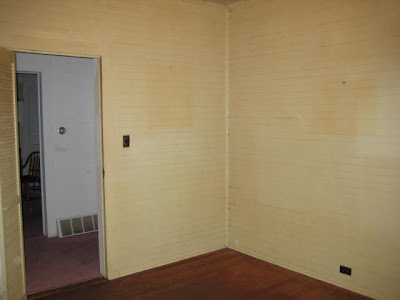 When I removed the switch plate to wash the walls, I discovered the original wood of the wall, which had been painted twice; once a darker green, and later a lighter green. 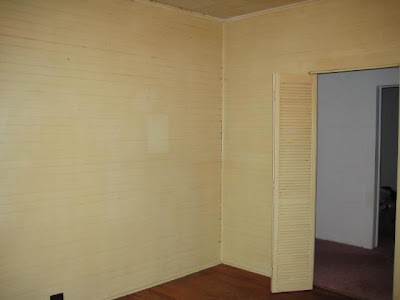 These same colors were used in several other rooms as well. These operate with weights and pulleys; you can see the pulley rope on this one seems to be in fairly good condition. 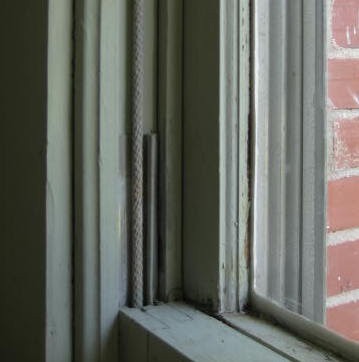 The ropes on some of the other windows are broken, and some of the windows are painted shut. This room presents several challenges for me. The first is that there isn't much wall space, and I have a lot of stash, books, and equipment! DH says I could put shelving in front of the windows, but I am loathe to block any of that light. Because of those windows however, and the orientation of the house (of which the front faces west), this room gets a lot of late afternoon sun. This in turn heats the room up considerably. 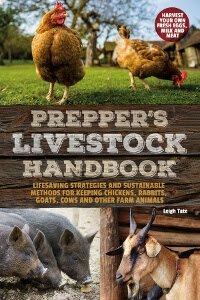 While this will be welcome during winter months, it has the potential to be unbearable during the summer. I have this problem at our apartment, but I couldn't do anything about it! 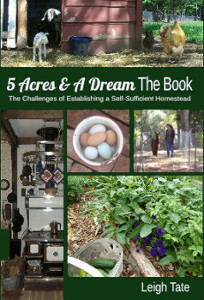 Now I can and I plan to plant a deciduous shade tree in the front yard this fall! The last challenge is the size of the room. 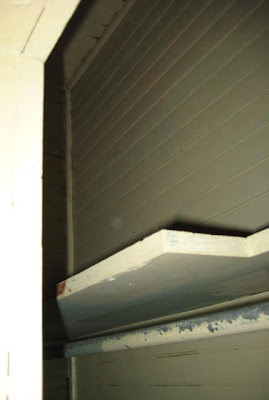 It measures 9' 3.5" by 19'11". It is the width I am concerned about, because of the size of my loom. My Glimakra Standard measures about six feet in width, so obviously the "getting around" room will be somewhat restricted. Depth-wise, my loom is about five and a half feet, not counting the bench. 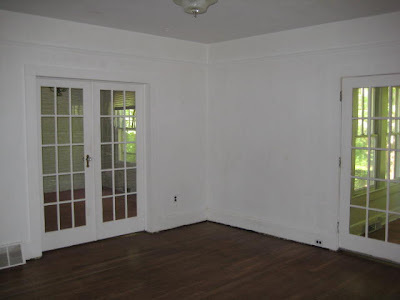 Even so, this is the perfect room for my studio! (Click here to see that).